So…it’s been a while since we’ve seen a Sammich Saturday post. Like, over a year. How can that be?? Well, it may have been too long, but you won’t even remember once you get a look (or even better, a taste!) of these little beauts. 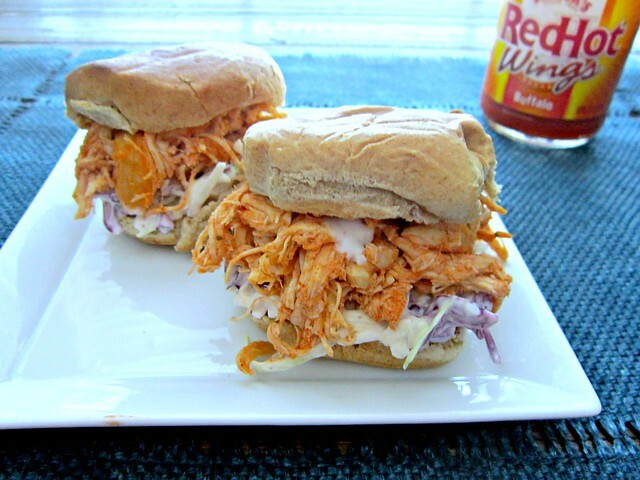 I mean, come on now…who can resist buffalo chicken with ranch slaw?? WHO?! When you are pregnant with your first child, people will give you all kinds of “advice” on what you should or shouldn’t do, eat, drink, etc. and one of the cautions I was given was to not eat spicy food, because it could hurt the baby’s tummy (also known as…gas), which terrified me. Because, I’m sort of obsessed with spicy food. So, in the beginning I tried to eat very little, until I could see how or if it affected her. Thank the good Lord, it doesn’t seem to phase her a bit. Jalapenos, Buffalo sauce, all the spicy things! Of course, I still try not to overload or eat it every day, but it’s nice to be able to enjoy the food I love, without causing discomfort for my little one. I think I’ve mentioned this a time or two before, but I’ve really grown to enjoy the crock pot. Maybe because we got a programmable one as a wedding gift so I can actually use it during the day when we are gone to work and not only if I will be home to watch it, or maybe because – like I mentioned yesterday – it allows us more time together as a family, instead of mama in the kitchen cooking. What I look forward to, among so many other things, is when Natalie will be big enough to be in the kitchen helping me. Until then, I try to be as efficient as I can, so that we still eat good food, but I’m not spending all my time in the kitchen in the evenings. It’s a balancing act, this parenting thing, for sure! People will always say how having a baby changes your whole life and that part is true. All the other “advice”, mostly unwanted, can be taken with a grain of salt, but this sentiment is 100% true. Life as you knew it, is done. But not in a bad way! Yes, I’m tired and sometimes I’m stretched thin, but the love I have for my tiny human – that baby girl who looks at me with such love and adoration – and the joy I get from being with her and watching her grow, taking care of her, feeding her…it is immeasurable. I waited my whole life for her to be here, and now I can’t imagine how there ever was life before her. And there I go gushing again. It’s like my fingers just start typing and I can’t stop them. Anywho…back to the sliders. They may be little, but they definitely pack a mighty punch! And of course, you can adjust the spiciness to your liking by putting more or less Buffalo sauce than the recipe calls for. I always go for more, but we’ve already established that I like having my tongue burned off by spicy food. If it’s any consolation, the creamy ranch slaw is the perfect crunchy compliment to offset some of that heat. Don’t take my word for it though…try them for yourself! 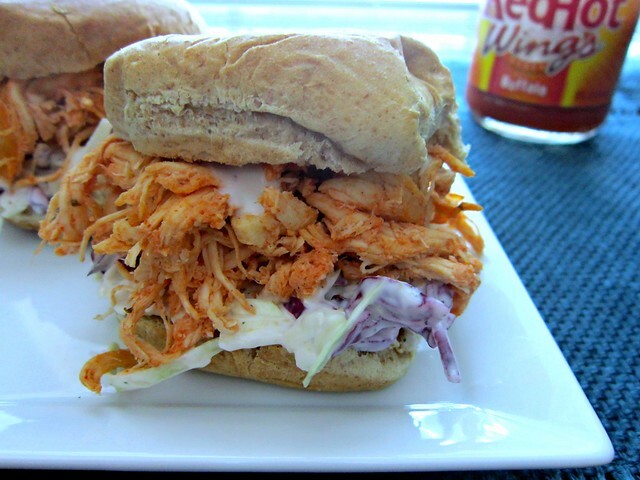 Spicy buffalo chicken and creamy ranch slaw make the perfect game day (or any day!) sliders to share with friends and family. Place the chicken breasts into a slow cooker, and top with 3/4 of the buffalo sauce and the ranch dressing mix. Cover and cook on low for 6 to 7 hours or on high for 3-4 hours..
Once the chicken has cooked, remove to a bowl and pour out any liquid left in the crock pot. Use two forks or the paddle attachment in the bowl of a stand mixer, to shred the chicken. Add the rest of the buffalo sauce and mix well. In another bowl, combine the coleslaw with the dressing, just enough to coat. You don't want soggy slaw. 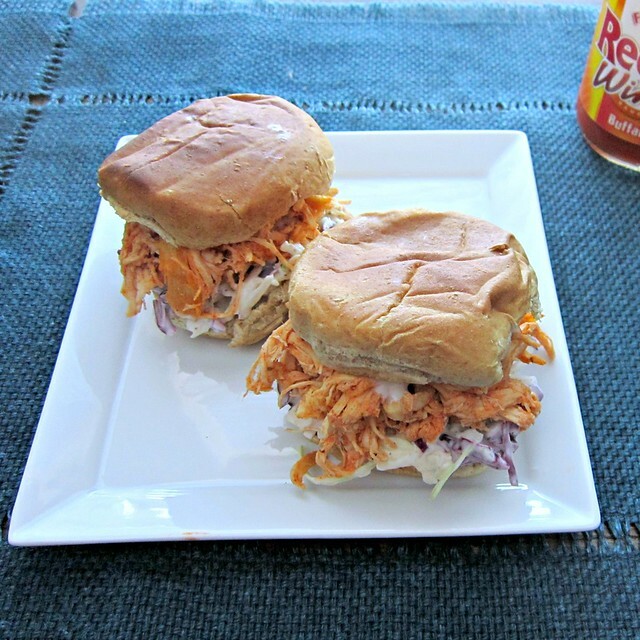 To assemble, place a heaping spoonful of the slaw on the bottom bun of each roll, top with a generous portion of the buffalo chicken, and drizzle a little ranch or blue cheese on top before placing the top bun on, and enjoy!